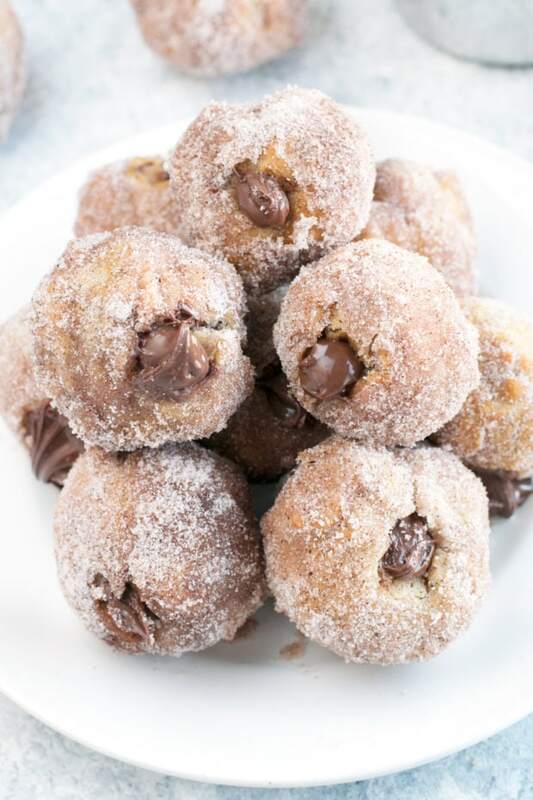 Nutella Filled Donut Holes are a chocolate hazelnut explosion waiting for you, wrapped inside cinnamon and orange scented dough. 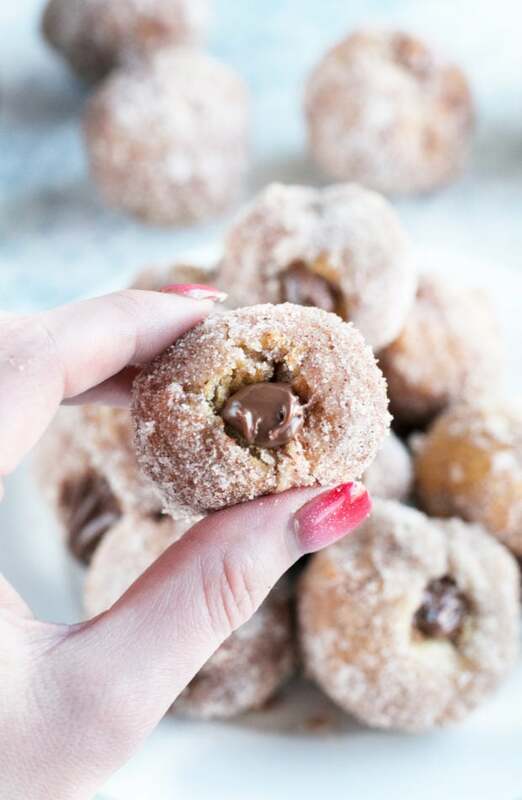 Waking up to these cinnamon-sugar coated treats are just the way anyone would want to start the morning, and you won’t believe how simple they are to make! Disclosure: I received free product and compensation from Bob’s Red Mill as part of this post. As always, all opinions and recipe are my own. Thanks for supporting the brands that support Cake ‘n Knife! 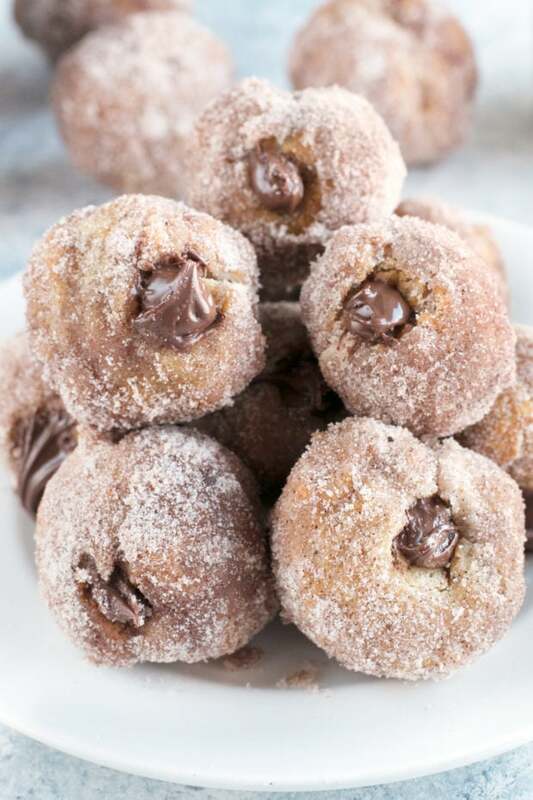 Because who could possibly resist anything fried, coated in cinnamon sugar and stuffed with chocolate hazelnut spread in the morning? 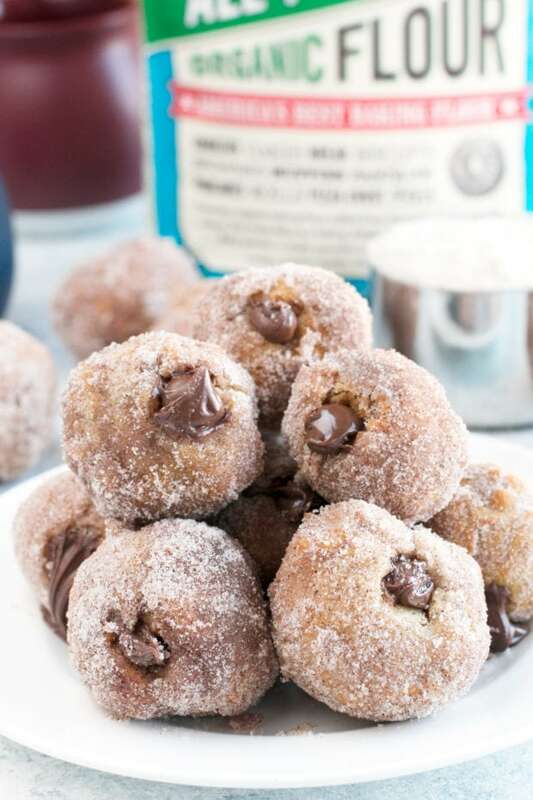 I mean, with a cup of coffee in one hand and one of these joyous donut holes in the other, you could essentially take on the WORLD. Please note that some of the links below are affiliate links. If you make a purchase through one of these links, I will receive a small commission. Thank you for supporting Cake ‘n Knife! Anything with the magic of a creamy chocolate hazelnut spread makes me feel like I can do anything. But of course there is NOTHING like devouring a fluffy donut hole that’s stuffed with it. Donut holes are magical, aren’t they? 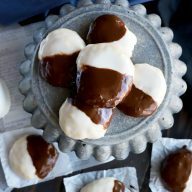 They are fully, small, and perfect for popping in your mouth (or even dunking in your favorite cup of morning coffee). While I used to buy them on my way into work, working from home has taught me the ease and downright deliciousness of making them myself. Once you have one that’s warm out of the oil, you can never go back to buying them in the store. When you are making anything fried that’s a dough base, you really want to make sure you are using the best flour possible. 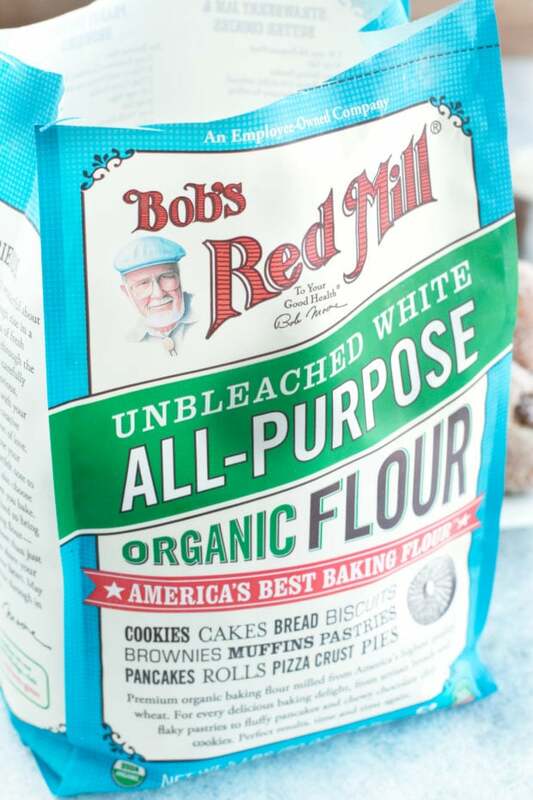 I always reach for Bob’s Red Mill Organic All Purpose Unbleached White Flour in these cases because they truly keep the texture of these donut holes light and fluffy. It’s because they are so light that you get the cinnamon and orange zest coming through in every single bite. It’s lovely not only to have a flour I depend on in times of baking madness (aka the past three months), but also when I need to make any sort of recipe that requires flour. It also is a HUGE comfort to me to know all the ingredients in my flour, and know that they are organic and come from the best source possible. Bob’s Red Mill just gets how to make a quality product and how to become an indispensable brand in your very own home. Once you start using their products, you will have a hard time going back to whatever brand you were using before – TRUST me. Just to prove how deliciously simple it is to make this recipe, check out my recipe below! 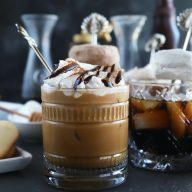 You’ll see that it honestly doesn’t take a ton of effort and the result is gooey, decadent and the perfect way to start any morning. 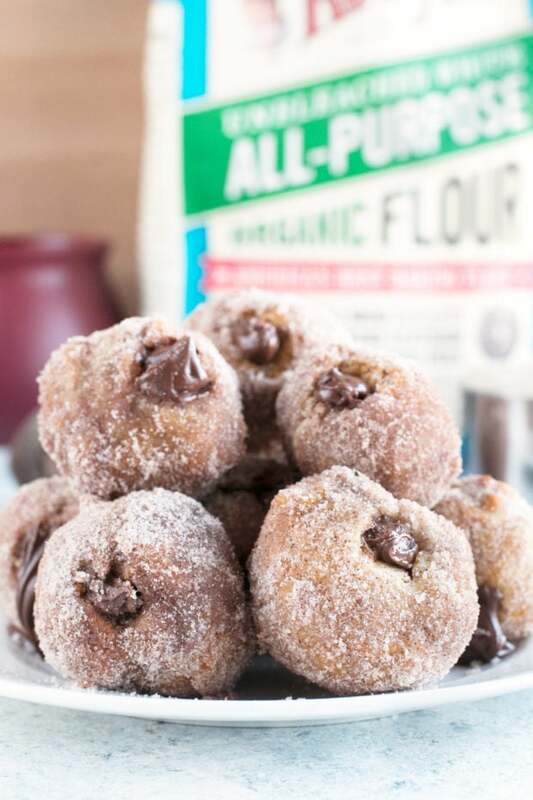 Pin this Nutella Filled Donut Holes recipe for later! 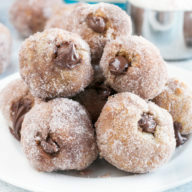 Nutella wrapped in orange and cinnamon scented dough, and coated in cinnamon sugar. Who wouldn't want to wake up to that?! In a small bowl, whisk together milk and egg. 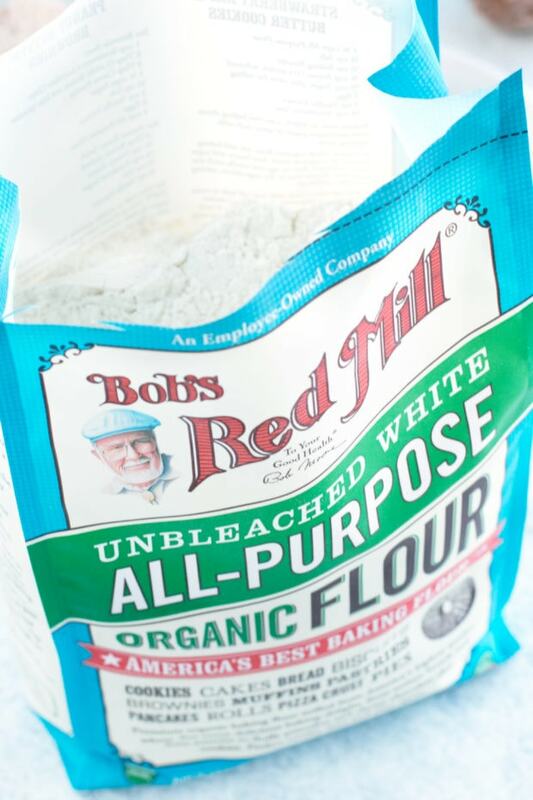 In a separate medium bowl, stir together Bob's Red Mill Organic All-Purpose Flour, cinnamon, orange zest, baking powder, and salt. Stir in milk mixture into dry ingredients until incorporated. Add melted butter and stir until a soft dough forms. 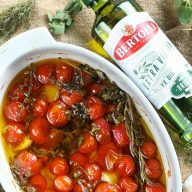 Add vegetable oil to a large heavy-bottomed saucepan so the oil is at least 2 inches deep. Heat the oil to 350 degrees F. Line a baking sheet with paper towels. Use a small ice cream scoop to drop 1 Tbsp amounts of dough into the oil (approximately 3-4 at a time, careful not to crowd the pan). Fry donut holes for about 2 to 3 minutes, until golden brown on all sides. Remove with a slotted spoon and add to the lined baking sheet. 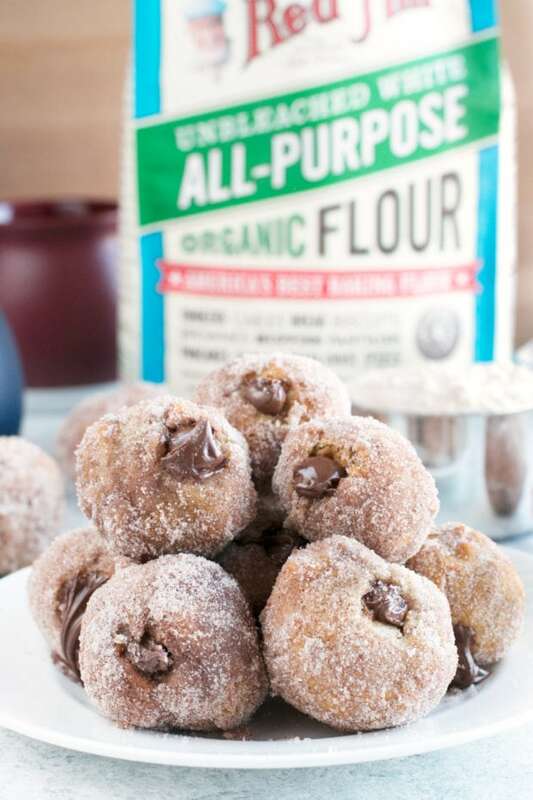 Once donut holes are cool enough to handle, add melted butter for topping to a small bowl. Add sugar, cinnamon and nutmeg to a separate bowl, stirring to combine. Gently dip the donut holes in butter, shaking off the excess. Then roll in cinnamon sugar and set on a cooling rack. Fill a piping bag fitted with an open star tip with Nutella. Gently insert the tip into one side of each donut hole. Squeeze Nutella inside until it just starts to pop out of the hole you made. These brought back memories of the nutella-filled beignets I once ate at D Bar. So good!